In most first-year anthropology courses Homo heidelbergensis is described as a widespread hominin species that lived in Europe and Africa between 700,000 to 200,000 years ago. 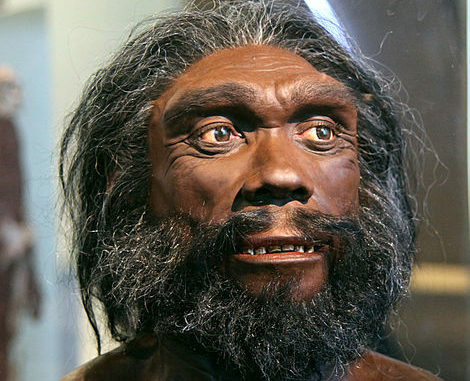 It is generally taught that H. heidelbergensis is the common ancestor from which modern humans and neandertals evolved. Thus, this species can be used to teach students about evolutionary principles like common ancestry, divergence, biogeography, and adaptation. The problem, however, is that many paleoanthropologists disagree as to which fossil specimens can be attributed to this species… and whether it actually is a distinct species. H. heidelbergensis is the name given to a fossilized lower jaw recovered from a Mid-Pleistocene fossil deposit in Mauer, Germany in 1908. The species was defined as being anatomically distinct from other hominins that lived at same time, such as H. erectus, neanderthalensis, and H. sapiens. 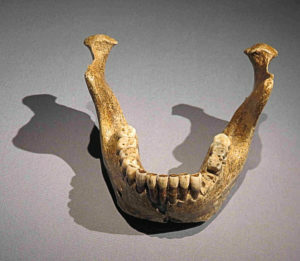 As more H. heidelbergensis fossils were discovered, three geographically distanced specimens came to represent the species: The Mauer Mandible (Germany), The Petralona Cranium (Greece), and The Broken Hill Cranium (Zambia). Here, the problems begin. The Mauer Jaw was not found with any associated cranial material. Likewise, the Petralona and the Broken Hill are cranial specimens and they were not found with any associated mandibular fossils, making direct anatomical comparison specimens impossible. Thus, H. heidelbergensis is largely defined by hominin fossils from a specific time period (700,000 – 200,000 years ago) that cannot be placed into one of the other three species from the same time perioid (H. erectus, H. neanderthalensis, and H. sapiens) on the basis of shared anatomical similarity. Some researchers divide the H. heidelbergensis specimens into two species on the basis of geography, retaining H. heidelbergensis for the European fossils, and using H. rhodesiensis for the African specimens. Other researchers further divide the Mid-Pleistocene hominin fossil record into even more taxonomic units: H. heidelbergensis, H. rhodesiensis, Homo cepranensis, Homo antecessor, Homo helmei. Homo daliensis, Homo soloensis, and Homo mabaensis. To teach this level of taxonomic minutiae in a first-year undergraduate anthropology is not practical. More importantly, teaching the students eight different names for Mid-Pleistocene hominins does not really tell them anything about Mid-Pleistocene hominins or Mid-Pleistocene hominin evolution. I am uncertain that telling lies is the best way to teach anyone anything. In this instance, using a lies as a functional placeholder for more complex information could only work if that student choses to continue taking anthropology courses, and more specifically, a course which deals in-depth with the Mid-Pleistocene fossil record. And what insurance could such a student have that he or she would simply be lied to again? Allowing for complexity and disagreement shows science is process, and not a series of facts to be memorized. Teaching complexity and uncertainty allows students use their critical thinking skills. It teaches them to weight the values of conflicting hypotheses. In contrast, using alleged pragmatic falsehood to motivate further learning seems absurd. Scientific uncertainty and complexity is an invitation to get involved.